M.: There is no mind to control if you realise the Self. The mind vanishing, the Self shines forth. In the realised man the mind may be active or inactive, the Self alone remains for him. For the mind, the body and the world are not separate from the Self. They rise from and sink into the Self. They do not remain apart from the Self. Can they be different from the Self? Only be aware of the Self. Why worry about these shadows? How do they affect the Self? We also try to develop positive qualities in us like practising certain disciplines like Ahimsa, checking one's temper, quelling hatred, jealousy, inferiority and superiority complex etc etc... While they are good, the truth is that all our attempts to become noble is exercised within the ambit of the mind. This should be fine if we are into personality development. In the Ramana way we try to dissolve the personality, the individuality, in the pure being, which is our true nature. Bringing in good thoughts will purify the mind. However, in the direct path such as the Ramana way, we simply enquire to see if the mind exists and on finding it doesn't, one simply is in his natural state of being. In the direct path, the focus is to find the source (the being or I AM) of the 'individual I' or the ego (the mind) which is responsible for the rising of thoughts. With the practice of Self-enquiry, one stays in the Source. 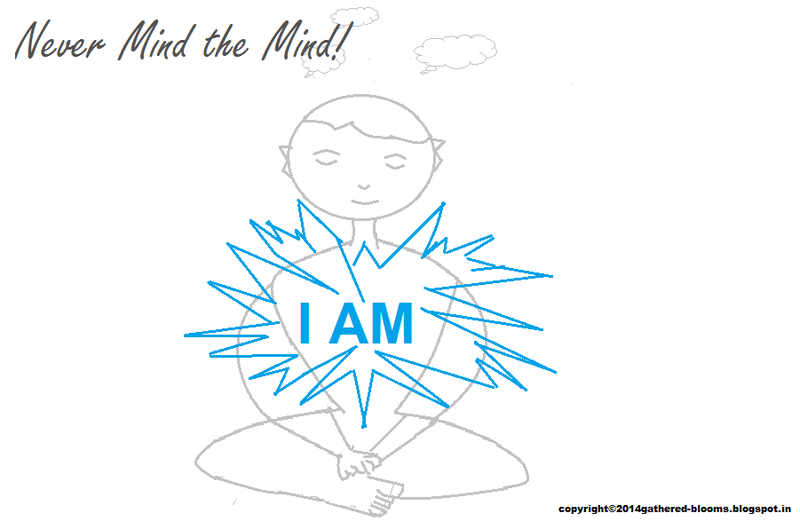 In the very beginning of sadhana, for some, it is natural to use “Never mind the mind" as a tool to stay at the source. It is only too natural for us to pacify ourselves when thoughts arise by saying "Oh it is only the mind". When clarity emerges with sadhana, we realise that even such reminders are basically thoughts. In the moment of such realisation, we experience the pure being, the peaceful state as thoughts dissolves in it. Sometimes thoughts spring up in a gush from past happenings that bog one down. The urge is to quell them immediately. The more we try to, the more they arise causing restlessness. Self-enquiry-'For whom are these thoughts? ', 'Where-from do these thoughts arise? ', 'Who am I', may also seem mechanical. It may seem as if we have lost all control. Ramana says 'never mind the mind' for its nature is to wander! We will have to inhere in the Self, which is the source. This becomes involuntary when practise becomes stable. We then focus directly on the source and not on thoughts. The thoughts recede to a hazy background when the ever-present Self, the source takes over; stronger the attention on the source, dimmer the thoughts become. This may be true when we have considerably practised Self-enquiry that to shift the attention to the source in a moment becomes possible. Stray thoughts, worries of the future, thoughts arising from the past and other forms of thoughts as mere shadows of the ego ghost (I thought). Experiencing the source or staying centered in it proves them non-existent. 'Never mind the mind' becomes natural, automatic and rather an involuntary process to stay in the source, to stay in peace with continuous practise by the Master’s Grace. By the way, why do we muse on "Never mind the mind", when the Master has said just that! lollll :) Lets not think, lets us just be!